Looking for a bus in Elgin? Chicago Charter Bus Company has access to hundreds of buses to take you to the Elgin History Museum, Grand Victoria Casino, and more. Otherwise known as “the city in the suburbs,” Elgin is a charming area 35 miles northwest of Chicago. Its proximity to the city means there’s just enough distance between urban life and suburban life—though, if you ask us, we think you get a taste of both in downtown Elgin anyway. The Riverside Drive Promenade is certainly a destination of its own, but if you ever have the need to arrange for group travel out of Elgin and to other parts of Illinois (or beyond! ), just know that Chicago Charter Bus Company has your back. There are a variety of bus and shuttle sizes available for you, so even if your group is on the smaller side, the 18-passenger minibus will have the cozy cabin perfectly sized for your passengers. Of course, medium and large groups also have options—choose from the 20-passenger minibus, 25-passenger minibus, or 56-passenger charter bus for any occasion requiring group travel near or out of Elgin, Illinois. When promptness is priority, don’t leave transportation to chance. 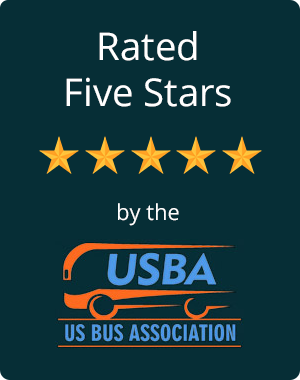 Chicago Charter Bus Company’s network of buses and drivers consists of only the best in the business—you’re getting a professional driver and spotless bus every time you book with us. Given the variety of bus sizes you can choose from, there are many types of occasions we specialize in. We happily coordinate wedding shuttles for savvy brides, ensuring guests get to the affair on-time and in style. We also work with corporate event planners to secure airport shuttles and large convention buses for various professional events. In addition, we partner with schools and officials to provide safe and spacious transportation for educational trips,sporting events, and more types of trips. Traveling outside of Elgin? With service throughout Chicago in neighborhoods such as Arlington Heights, Evanston, Highland Park, Oak Park, and more, we're always able to accommodate all of your Chicago-area travel. Ready to rent a minibus, shuttle, or charter bus for your adventure around the Elgin and Chicago area? Still on the fence? Though the best way to get an accurate price for your bus and driver rental is to speak with a booking specialist at 312-667-0906, you can also browse general pricing information. Prices can change based on the upgrades you choose to make—just ask what’s available… There are plenty! Our booking specialists are available 24/7 to chat. Call us today at 312-667-0906, and let’s get you on the road.